Dorri Amri (Esmailpour), 44, began serving her one-year prison sentence in Vakilabad Prison in the Iranian city of Mashhad on November 14, 2018, for allegedly propagating her Baha’i faith, a source with knowledge of the case told the Center for Human Rights in Iran (CHRI) on November 19. Amri, along with two other Baha’is, May Kholousi and Shayan Tafazzoli, had been arrested by agents of Iran’s Intelligence Ministry in Mashhad in June 2014 during a prayer session in Kholousi’s home. A few days later, Kholousi’s daughter, Saghi Fadaie, was also arrested. Fadaie was freed after 85 days while Amri, Kholousi and Tafazzoli were released on bail after five months, the source added. 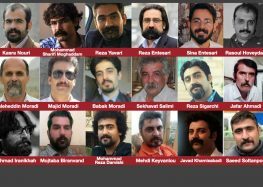 “All of them were put on trial in three sessions at Branch 3 of the Revolutionary Court in Mashhad presided by Judge Mohammad Soltani and charged with ‘propaganda against the state’ but the reason was unclear,” said the source. All of the sources who spoke with CHRI for this article requested anonymity for fear of reprisals by security agents for speaking to a foreign organization. Iran’s Constitution does not recognize the Baha’i faith as an official religion. Although Article 23 states that “no one may be molested or taken to task simply for holding a certain belief,” Baha’is are denied many basic rights as one of the most severely persecuted religious minorities in the country. The four were sentenced to one year in prison each, and the Appeals Court in Mashhad upheld the sentences in August 2018. Kholousi and Fadaie began their prison terms in Vakilabad on October 31. Tafazzoli has not yet been summoned to prison. Tafazzoli and Fadaie, both 28, were both denied university admission in 2008 because of their religious beliefs despite having passed the national enrollment exams, according to the source. Baha’is are routinely denied the right to higher education in Iran, either by being banned from enrolling in a university or being expelled without a proper explanation once enrolled in the school. Two other Baha’is have also been summoned to prison in the southeastern city of Yazd. Nasser Bagheri, 52, and his son Faez Bagheri, 20, have been sentenced by a preliminary court to nine months and two years in prison respectively for allegedly preaching their faith. Nasser and Faez Bagheri were arrested in March 2015 for holding Baha’i book reading sessions at their home, Peyman told CHRI. At the time, Faez was 17. Nasser Bagheri’s wife, Fariba Ashtari, served a two-year prison sentence for allegedly promoting Baha’ism. She was also charged with colluding against national security. Ashtari was released in January 2017. A Baha’i community source also informed CHRI about the arrest of five members of the faith by the Intelligence Ministry in Tabriz, northwestern Iran, on November 17 and 18: Farzad Bahadori, Kambiz Misaghi, Shahriar Khodapanah, Monika Alizadeh and Kheirollah Bakhshi. “The intelligence agents showed a warrant but did not give a reason for the arrests,” said the source on November 19. CHRI was able to confirm that Bahadori and Khodapanah are eyeglass lens distributors and Misaghi has an optometry store in Tabriz.